I can't believe it -- This Saturday I get to attend the baptism for my nephew Ryan! It's been a while since I've seen him, so I'm so excited that our trip coincides with his baptism. I've been packing and getting ready, but I couldn't pass up this great opportunity to make him his own Baptism Shout Out game. My brother teaches in 7 turning 8-year olds in primary and has been asking for this game since January, but there's nothing like a deadline to make it a reality. He wants to use it at the end of lessons to keep them reminded up their upcoming baptisms, or the baptisms they just had. (I think he's also a bit tired of hangman). The images on these cards include religious like a girl being baptized, scriptures, a dove, and sacrament trays. There's also practical images like a towel, clothes and a camera. There's 31 images in all. 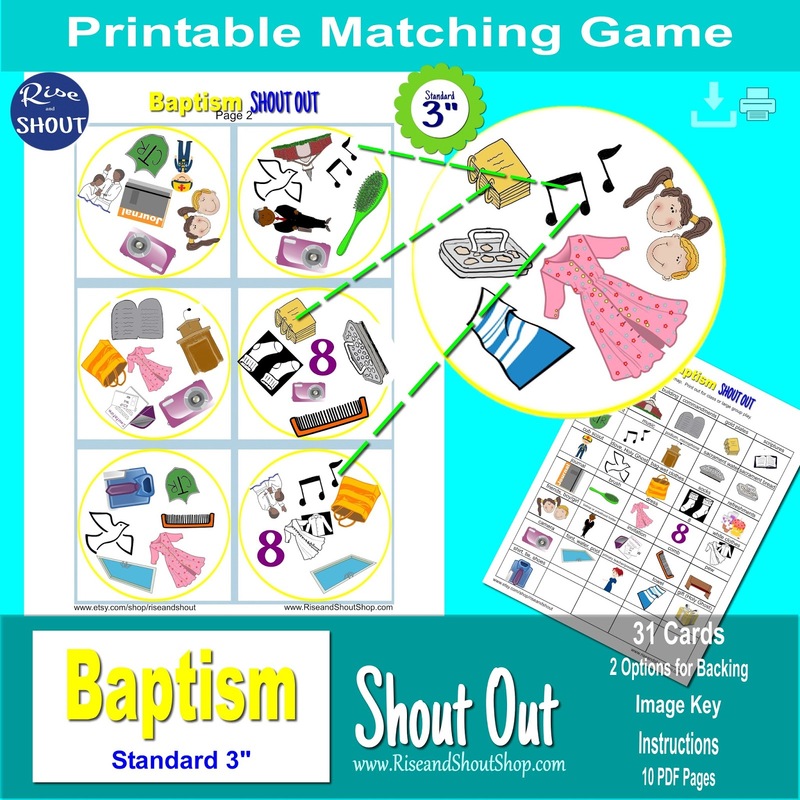 Playing at the beginning or end of a lesson, whether in primary or at home, is perfect with Baptism Shout Out. A child (or adult) can even race the clock and play solo. Each round only takes a couple minutes, and you can play as many or as few rounds as you want. To play, pass out one card to each player. Place remaining cards face up in the center. Each card has one, and only one match, to the center card. Find your match first and Shout Out. Collect the most matches to win. 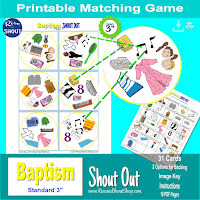 To purchase Baptism Shout Out, click here.